Coaches departed early in the morning to take all the members of the IAJU Assembly from Bilbao to Loyola. It is a one hour trip to the Urola Valley, a beautiful place in the heart of the Basque Country with a spectacular natural environment and an astounding historical and monumental heritage. The Sanctuary of Loyola, built around the Loyola family Tower House, is the spiritual center of the region and a foundational reference for the Ignatian family worldwide. “This is where everything started 500 years ago” stated Ignacio Echarte SJ, former Secretary of the Society and now a member of the community of Loyola, in his welcoming message. In this extremely significant place, Jesuit universities from across the world officially constituted today the Association that will afford new opportunities for collaboration among them. The Charter of the new institution was signed at the altar of the Basilica by the Superior General of the Society of Jesus, Arturo Sosa SJ, the Secretary of Higher Education, Michael J. Garanzini SJ and one representative from each of the six Conferences or regions of the Society of Jesus: Latin America, Europe, Asia Pacific, South-Asia, Canada and the United States, and Africa and Madagascar. Before signing the founding document, Superior General Arturo Sosa delivered his main address to the Assembly. Entitled “The University as a source of a reconciled life”, his words expressed how universities’ endeavours are a way of fulfilling the mission of reconciliation defined by the General Congregation. It is a mission that needs to be carried out with creative loyalty to our tradition and through collaboration. 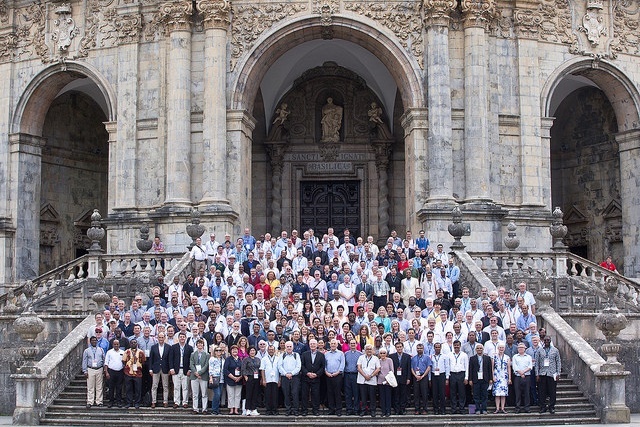 By creating the International Association of Jesuit Universities (IAJU) “we can usher in a new era and a new style of fruitful work within the university”. During the day, the participants were grouped into the six Conferences of the Society of Jesus, where they discussed specific priorities for each context. The Father General spent half an hour with each of them. We will know some of the results of these discussions tomorrow at the plenary of the Assembly. The day also included some group visits to emblematic Ignatian places around the Sanctuary: the family home of Ignatius, with its Chapel of the Conversion (“the heart of the Sanctuary”); the Hospital of Magdalena, where Ignatius decided to stay when he returned to Azpeitia in 1535; and the birthplace of Blessed Francisco Gárate. In the afternoon a Holy Mass was held at the Basilica presided by the Father General Arturo Sosa, along with the Provincial of Spain, Antonio España SJ, the Secretary for Higher Education, Michael J. Garanzini SJ, and the Rector of the Sanctuary of Loyola, Juan Miguel Arregui SJ. It was, without doubt, one of the most emotional moments of the entire IAJU Assembly. In his homily, the Father General spoke about the need for “detachment” to follow in Jesus’s steps. This need “not only applies to individuals, but also to institutions”: detachment from what they possess, detachment from what they are and used to be. It is in this same vein that the Society of Jesus has expressed its will to “take the step to become an apostolic body of collaborators, men and women, in a mission of reconciliation and justice”. A spectacular group photo taken on the staircase of the Sanctuary was the perfect ending to this beautiful day that had moments that are already part of the history of Jesuit higher education and will forever form part of the personal memories of those gathered today in this holy place.